This is the last card from our class last Saturday. One of our attendees, Betsy, loaned me this pretty set from Close to My Heart. It was the first time I had used any of their products and I loved the images and the packaging. Unfortuntely, I forgot to write down the name of this set. It has many lovely nature images - we weren't sure if they were flowers or weeds but they make up nicely with the greetings. This tri-fold card is scored with sufficient paper to overlap and tear the edges. 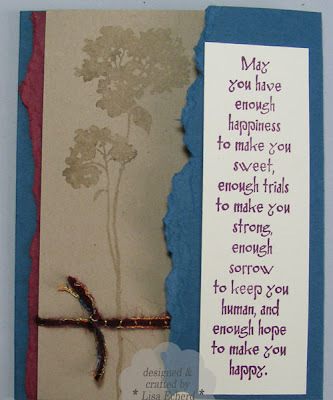 I suggested they distress their greeting block with Soft Suede and that gave a pretty effect to the card. The image is stamped off with Soft Suede ink on the Kraft cardstock - a combo I really liked. This month we do Birthday cards on March 20. This Saturday is our regular SU club by our demonstrator Jean and I'm the hostess. Lots of fun events coming up. Ink: Rich Razzleberry, Soft Suede by SU! What a wonderful sentiment, beautiful floral image and awesome design. Love this!